Juice and drink up right away. I have owned a juicer in the past, but never used it. I do enjoy fresh “live” juices from a juice bar (they taste better when someone else has to clean up the mess!). However, my mother in law has a juicer and I thought I would give it a whirl again on my own during the next couple weeks before we leave. I found this juice recipe on Rawkin’: The Fine Tuned Art of Feeling Great From Eating Raw. It’s so cool that this can turn into the above photo! Bella loves to help me too. I’ve been hearing about the amazing effects of “green drinks” for quite awhile now, but I’ve never implemented them. I’ve made the green lemonade for two days in a row now, and I am completely amazed at the results after such a short time. On a “normal” day, I eat a healthy high carb breakfast…and by mid-morning I’m back in the kitchen looking for a snack. And that continues for the remainder of the day (eat/snack/eat/snack). Not that there is anything wrong with snacking…I encourage it. However, my all day CRAVINGS have almost disappeared. My sugar cravings are going away, and I just feel “content” for so much longer than before. I’m excited to continue this for at least a week to gauge it’s effects. Yay! Sidenote: For those of you who are thinking…GREAT! But that looks disgusting! It’s actually NOT. It doesn’t taste like grass. It’s rather sweet. The apples give it a delicious sweetness, and if you need it sweeter, just add some agave nectar. Whenever you are working with greens, just remember to add a sweet fruit with it…like a banana or apple. Mmmmm! Here is a great article written by Victoria Boutenko (check out their “Raw Family” site)…it goes into more detail about why greens “fix” you 🙂 Next, I will try her green smoothies…which include the fiber of the fruits/veggies as well. In a juicer, place all ingredients except optional ice cubes in a juicer until juiced. Serve in your favorite wine goblet or other favorite glass of choice. If desired, add ice cubes for a refreshing cold beverage. And now…. here are the same ingredients, but this time this is the recipe that Dr. Oz mentioned at the end of the Oprah show. His recipe needed a bit of clarification, so our changes have been added below to help you understand his recipe. Mix everything in a blender and blend until smooth. If needed blend on high 2-3 times until fully blended. Pour into two tall glasses and serve with ice cubes if desired. Here is one more Green Smoothie recipe, this time with the addition of a banana. Adding a banana (or several) into a green smoothie gives it an unbelievable creamy texture, as well as helps the energy from the smoothie get absorbed into your body at a slower pace, which gives you released energy for hours! Place all ingredients in blender except ice cubes. Blend, adding ice cubes at the end while still blending. Pour into glasses. Entry filed under: Juicing, Raw. Have you read Victoria Boutenko’s newest book Green for Life. I was just about to recycle an extra copy to the Library. If you want it – just let me know…I can send it to you. It’s excellent. I heard her speak last month with her daughter. They made green smoothies and told the wondrous story of them. I would LOVE her book! Yay! Expect an email from me sometime this weekend (in reply to your previous one). Take care! 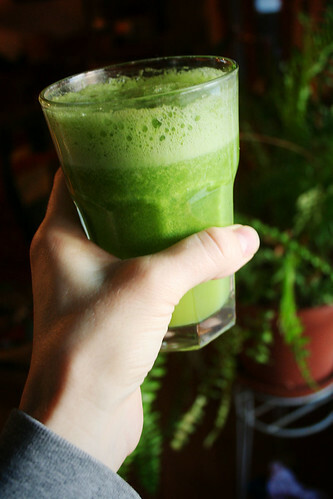 Unfortunately we differ in the fact that I think the green drinks/smoothies look so gross! I have no interest in drinking one, especially not for breakfast -ew! So glad you are blogging about food again! Hilarious becuase for our “salad” last night with dinner I made the green smoothie that Rawkin gives directions for on her YouTube video! Even my DH who thinks the whole Green smoothie thing is gross liked it! 🙂 And it’s the only way my 19mo will eat any lettuce! Denise! Of all people….I would think that you would be the one to LIKE green drinks. You at least have to give it a try. Your body will be soooo happy! Ha! So funny to read this today. I just finished my green lemonade for the morning. I’m back into juicing, too. My recipe is exactly the same except add some ginger. Gives it a nice refreshing little kick. My recipe is from Raw Food Detox Diet by Natalia Rose. Might want to see if you can find any of her books. Her recipes are easy, using easy to get food, and the flavors are delicious! I’m so glad you’re keeping up this site again; food is the one “hobby” I have time for during the school year. I’m drinking my second cup of green smoothie right now as an afternoon snack! I keep hearing about green smoothies at every turn so I took a really ripe banana, a peeled/cored/cut into chunks Granny Smith apple, 3/4 cup baby spinach and about 1/2 cup water and blended it… IT WAS DELICIOUS!!! We just drank 2 pitchers full…my boys turned up their noses at it until I called it “The Incredible Hulk” drink and they downed them and begged for more! Will (my 21 mon old) won’t touch anything green and he drank a bunch too! I started googling the health benefits a few minutes ago and I am amazed…a new addiction for sure. So it is possible to do all this in a blender, not just a juicer? I am always so hesitant trying things for the first time and need someone to hand hold. ooooh! this sounds so good and i’m so grossed out right now from too much popcorn and coke from the movies tonight. but it’s too late to drink such an energizing meal this late. i would actually like to sleep tonight! i only have come romaine in the house right now but i know what my breakfast will be tomorrow! p.s. we ALWAYS keep frozen bananas in the house. i wish i could freeze everyfruit that easily. i’ll never throw away another banana again in my life! you’re actually a excellent webmaster. The website loading speed is amazing. It kind of feels that you’re doing any unique trick. In addition, The contents are masterpiece. you’ve done a fantastic activity on this matter! I’m gone to convey my little brother, that he should also go to see this blog on regular basis to obtain updated from most recent news. hit the nail on the head. The issue is something too few people are speaking intelligently about.